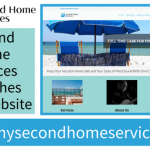 Second Home Management Services are customized to meet each homeowners’ needs. Our basic Home Watch Services include a thorough weekly inspection of the home. In addition, we keep an inspection log which is forwarded to the homeowner quarterly. Pricing for this service will be standard for each visit and is based primarily on the square footage of the home.